Hoppo Bumpo: About to make my fortune? About to make my fortune? 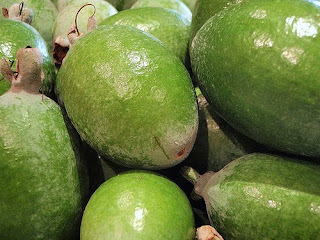 Its April and feijoa season. Have you seen the little green fruit? 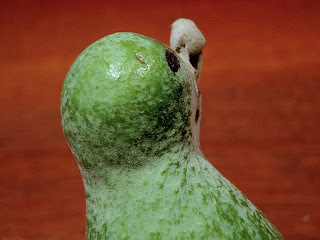 They are about the size of an egg, native to Brazil and related to guavas. I believe they are quite popular in New Zealand, but seldom seen here in Australia. Except for my place, where I have quite a lot. You see about two years ago I asked my parents not to lop the huge feijoa tree in their garden. As a result I now receive all the fruit. At the time of writing, I have taken receipt of approximately a bazillion feijoas. And as is often the way in nature, with volume I have started to see some variation in the shape of the fruit. For example, this penguin turned up today. I am deeply suspicious (but cannot prove) that the eyes and wings were added, sometime after it parted company with the tree. That aggressive expression is, however, quite genuine. 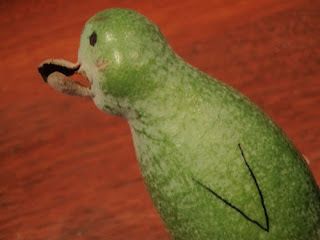 The question is whether I should make it into chutney ... or follow this example and list a Rare Feijoa Penguin (Cranky Disposition) on eBay? Love it. Well I would, wouldn't I!? Ebay! Ebay! Why are you still reading this? Why haven't you listed yet? Never even heard of feijoa before let alone seen such a prime specimen. That's really cute. Ebay AWAY! A bazillion minus one for chutney. Don't s'pose it's too late to see if there are any high earners in the shape of something Easter and religious? I've never heard of this fruit - it does look a little cross! Ahhh, Liesl. You're a nut. A very fruity nut. Love him even for all his grumpys. 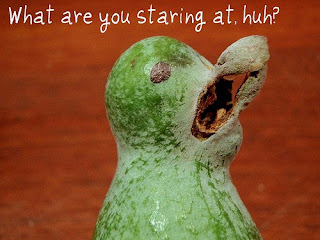 I;m a bit amazed by the whole kiwi feijoa ebay saga, but I guess waste not want not..
PS I wonder what the winner did with the kiwi. Please go with the ebay listing. Please, pretty please. ive never heard of this fruit and they're certainly not grown here in the UK. I must take a look around see if they are imported. I love to try new foods!